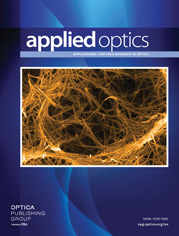 The authors are with Indian Institute of Science, Department of Electrical Communication Engineering, Photonics Laboratories, Bangalore-560 012, India. The results of an experimental investigation on the storage life and reprocessibility of methylene blue sensitized dichromated gelatin (MBDCG) holograms are reported. The major conclusions of the investigation are: (i) Storage of MBDCG holograms in normal laboratory conditions for long periods is possible and it diminishes somewhat their diffraction efficiency. (ii) The results on short time storage and long time storage are almost similar, thus indicating that the diffraction efficiency can be stabilized through storage in a relatively short period of time. (iii) The deterioration in the diffraction efficiency on storage is less [D(η) < 20%] for gratings of low/medium initial efficiency (η < 70%) and it is more for gratings of high initial efficiency. (iv) About 65–95% restoration of the diffraction efficiency can be accomplished through reprocessing. (v) The restoration of diffraction efficiency is almost perfect [R(η) > 80%] for gratings of low/medium initial efficiency (η < 75%) whereas it is rather imperfect for gratings having high initial efficiency.